My husband and I went this morning to our middle son's school to watch him and his classmates sing some adorable Halloween songs in costume. He did the motions and whispered the words. It was sweet! I wasn't feeling great and stupidly went to work anyway. By 3:00 I was done so left and am now home. I am going to help my older son with homework then relax, but before I do that wanted to share this quick tip. Get It Done Tip: Like almost every school nowadays the teacher keeps a blog where she makes note of homework each night. I set up a recurring reminder on my calendar for 6:30 pm each day with the link for the site and log on information so I can just click on it when it pops up and get organized quickly with what needs to be done. Now, if only my son would bring home the right books and the teacher would regularly post we'd really be in great shape!! Homework Tip - My kids like to play a bit after school and usually don't like to stop to start homework. Turned into a power struggle for me. I made a deal with them at the beginning of the year: They can play first after school but they have to start their homework when I say it's time. No complaining or fighting. 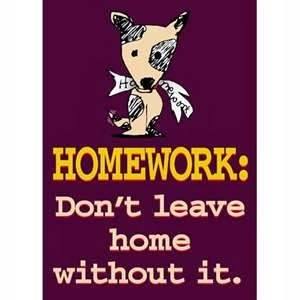 If they give me a hard time, the next day they have to do their homework right when they get home. Since starting this new rule I get very little resistance!